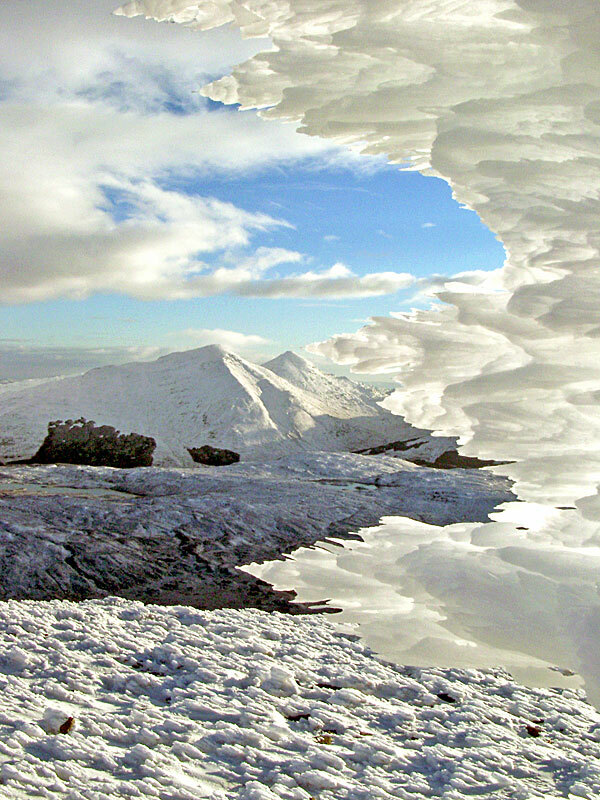 Bheinn Bhuidhe is an long, isolated Munro and its bulk separates the upper reaches of Glens Fyne and Shira. 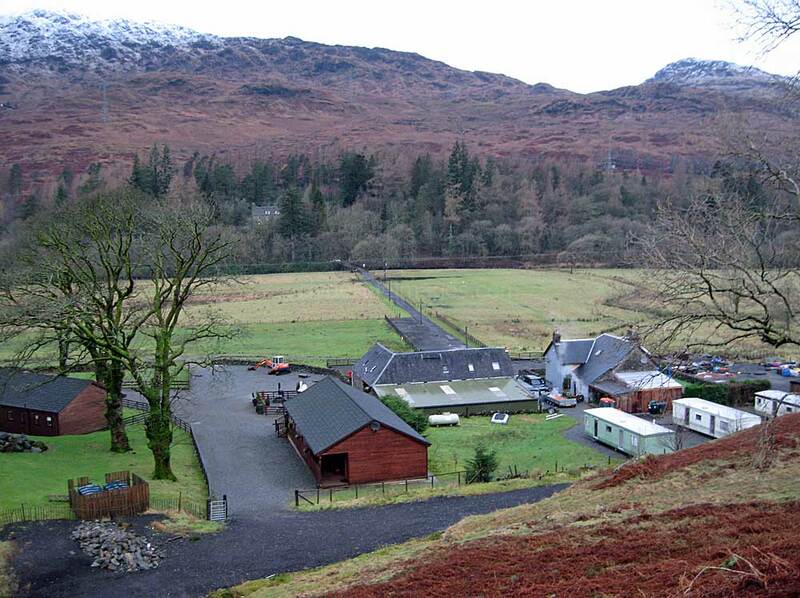 The normal approach is made along the private road leading to the cottage of Inverchorachan, via Glenfyne Lodge. 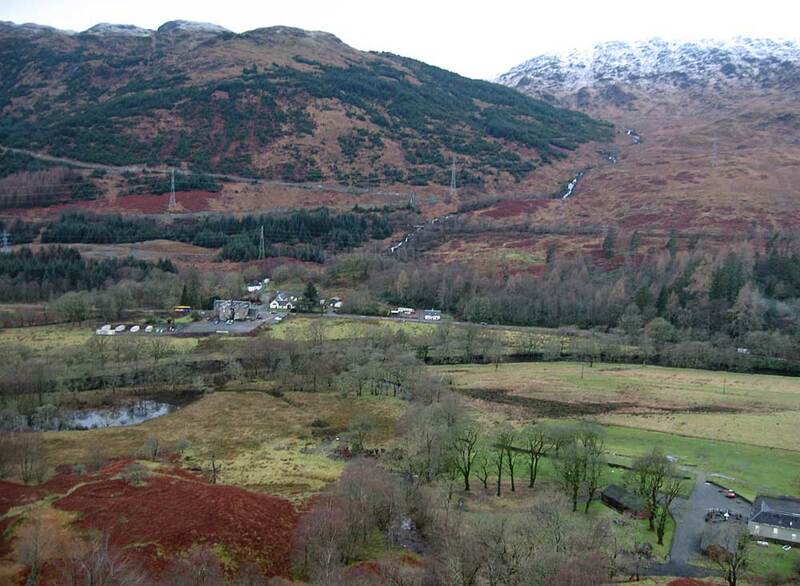 The road up Glen Fyne is rough in places but outwith the stalking season cars can be left beside a Hydro-Electric Board power station beyond the lodge, thus shortening the walk-in by several kilometres. A clear morning but cloud moved in quickly and the rain came on soon after a pal and I started walking. 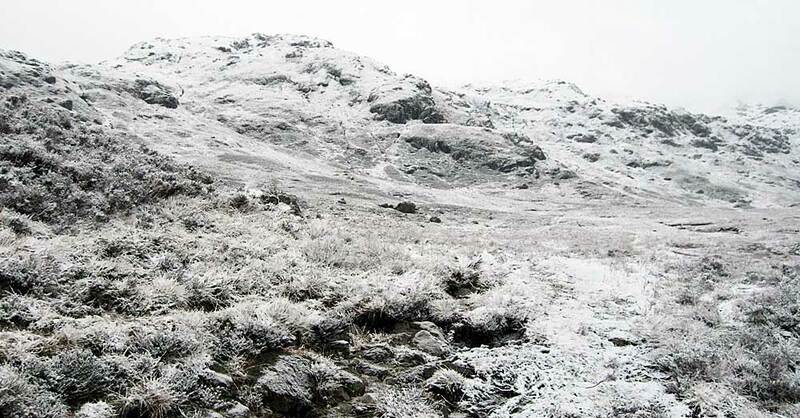 A gain in altitude turned the rain to snow and it became a slushy slog across the two-kilometre stretch of peat hags which lead to the final 1,000 feet or so. Even although the mountain`s two-mile long summit ridge would be impossible to miss, the poor visibility made it hard to believe that there was such bulk straight ahead. When we reached the trig` point it stopped snowing but despite brief glimpses of blue above us the cloud failed to clear and we got no views of the surrounding terrain. Climbed this hill again, this time along with a group of workmates on a wild, wintry and very windy day. 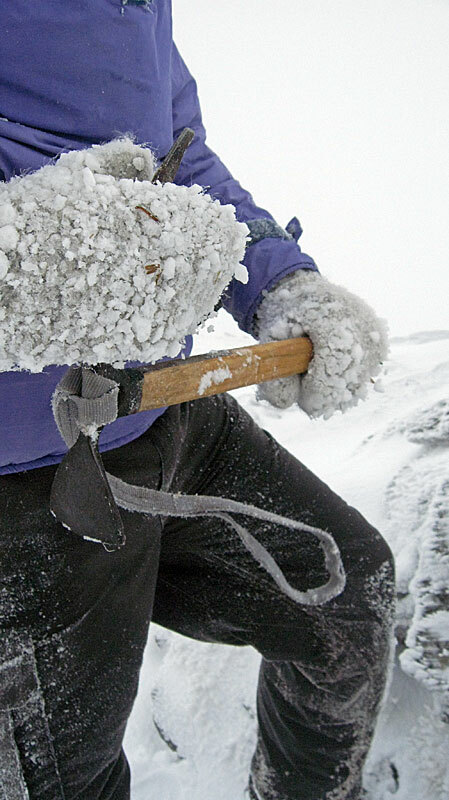 Several of us spent a while digging a large snow hole in a steep gully, practising our emergency survival skills. 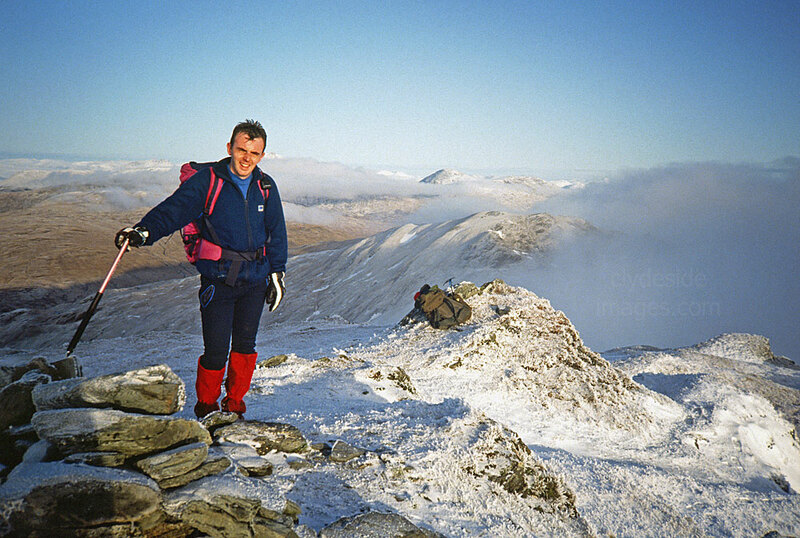 Above: John K catches his breath at the cairn as the last of the clouds blow clear. A second outing here with a group from work. On the way up Glen Fyne, our hired van ran over a metal spike on the track and punctured a tyre. As often happens, usually when you`re miles from anywhere, we found that there was no jack on board! At least there was a spare wheel so a jack was hastily improvised consisting of several large boulders, and a dead tree trunk, at the end of which several volunteers balanced precariously. They raised the van just enough for a quick wheel swap and, having already obtained permission to park further up the glen, we continued on our way quite chuffed with our ingenuity. 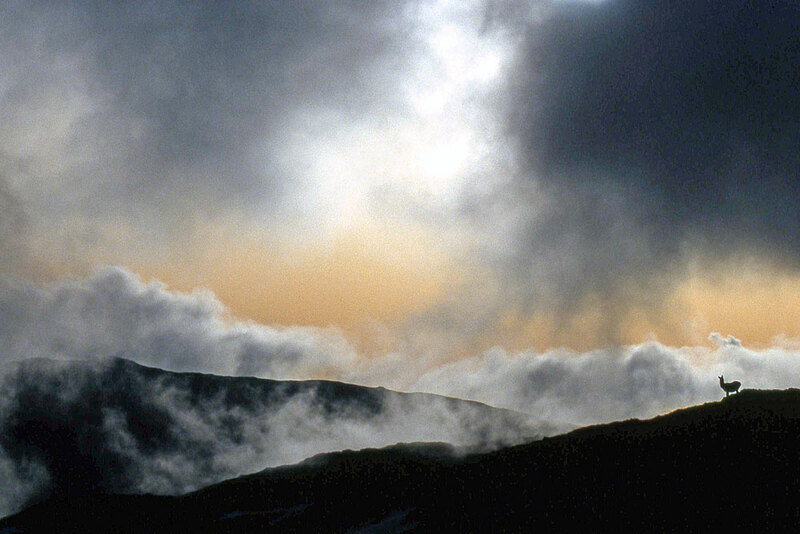 ​The sky was particularly stormy initially with dark clouds boiling up below Beinn an Lochain. This deer appeared on a ridge-line making a dramatic silhouette. It got much brighter as we climbed onto the plateau via a snow ramp and there was a heavy frost underfoot. Any remaining clouds were blown over the summit ridge with one holding a Brocken Spectre. 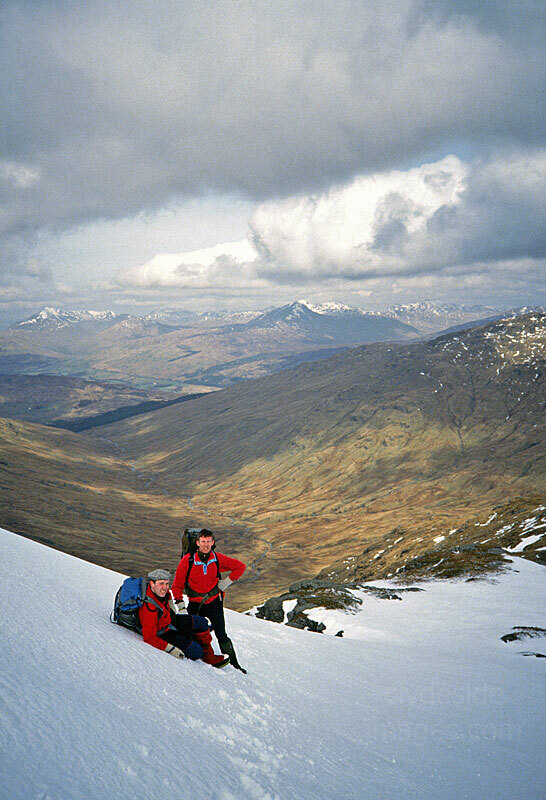 Beinn Bhuidhe from the west end of Meall an Fhudair, Friday 1 March 2002. (Image from 35mm colour print). 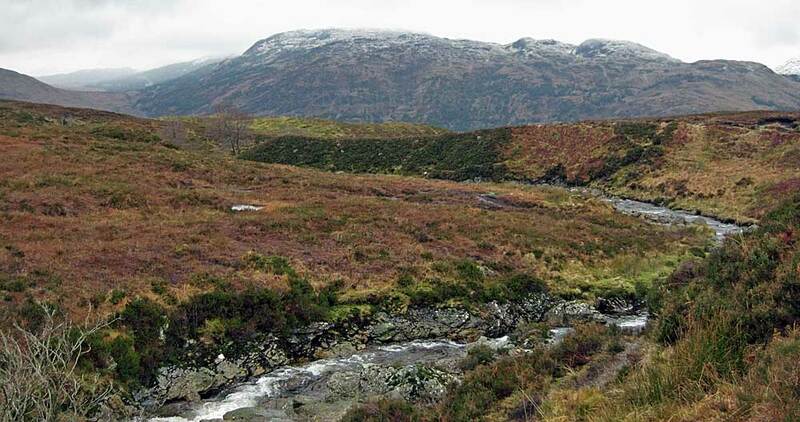 Meall an Fhudair and its lower and more often climbed neighbour Troisgeach form an extensive and relatively featureless mass of high ground between Glen Fyne and the south end of Glen Falloch. 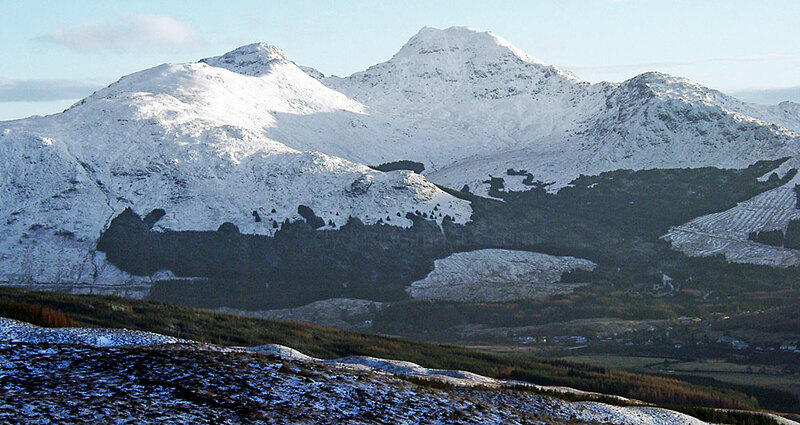 Troisgeach, at he east end of the long, broad ridge makes a popular short outing for its fine views down the narrow north end of Loch Lomond and towards the seldom seen `back end` of Ben Lui and its neighbours. 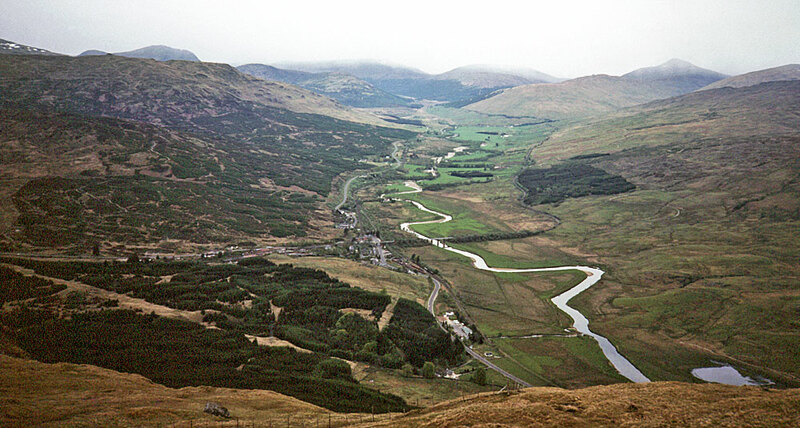 The long narrow pass of Glen Falloch runs northwards from the top end of Loch Lomond for almost 13km (8 miles) to Crianlarch which sits at the junction of Strath Fillan and Glen Dochart. 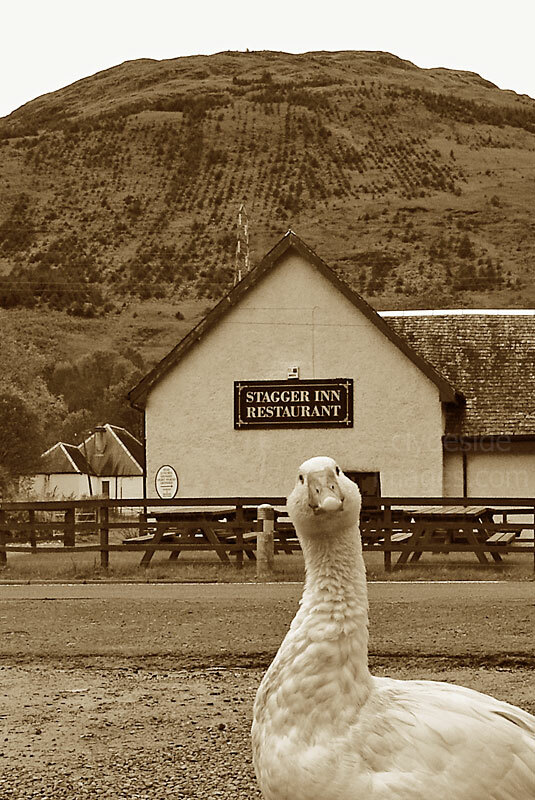 A left turn takes travellers, whether by road or rail, to Oban or Fort William with the Perth and Stirling road coming in from the east. Unfortunately the railway coming in from this direction was closed decades ago. 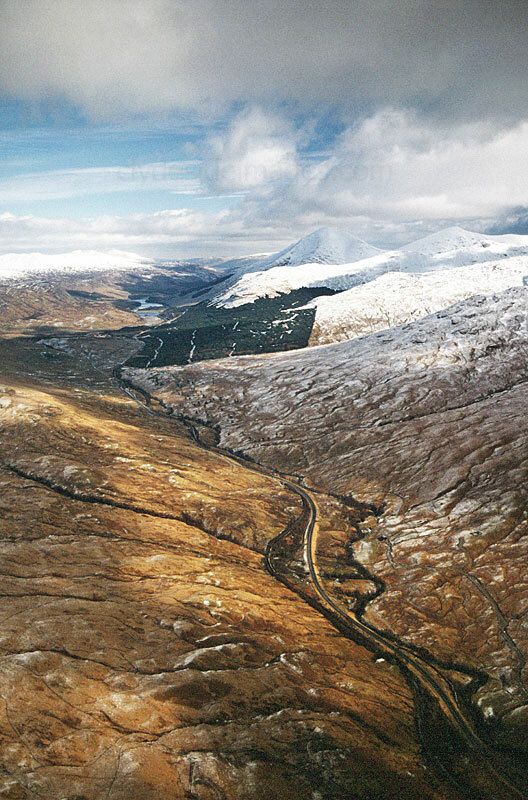 Two mountain groups border Glen Falloch, one on either side, The Tyndrum group to the west and the Crianlarich group to the east. (LINKS*). 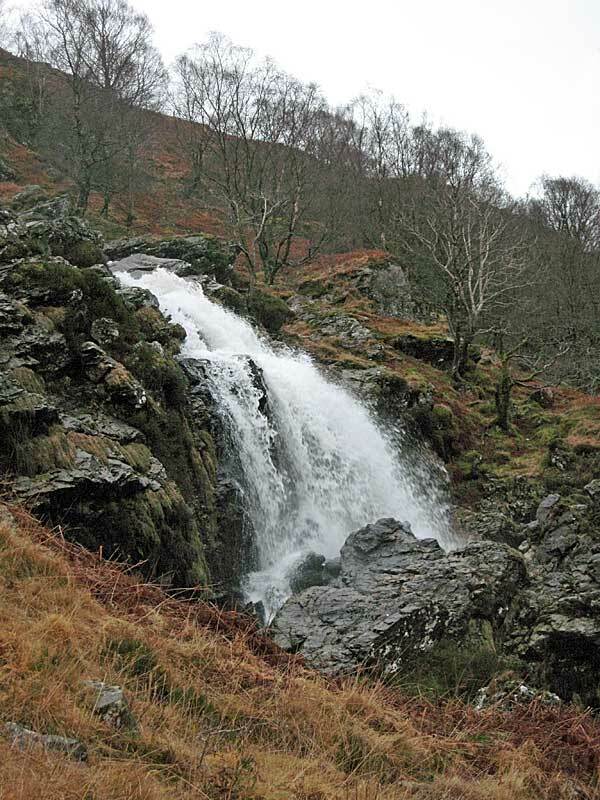 The River Falloch tumbles steeply southwards over a series of waterfalls which are impressive when in spate, thought the glen, the southern end of which is heavily wooded. all screened by lower slopes. 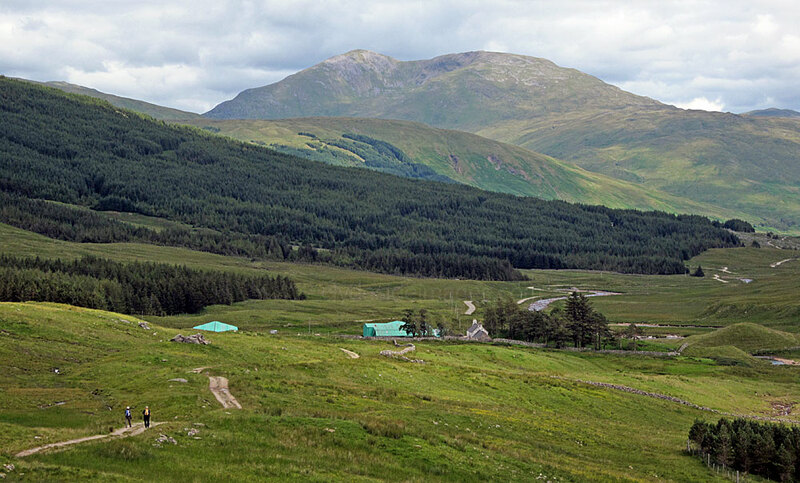 The four Tyndrum peaks, the others being Ben Oss, Ben Lui and Beinn a` Chleibh (LINK*) can be climbed from lower Glen Falloch by following the Dubh Eas burn, or via the Fionn Ghlinne which is entered opposite the Falls of Falloch. It should be mentioned, however, that neither of these routes is potentially as scenic as the standard approach along the Cononish from Tyndrum or Dalrigh. 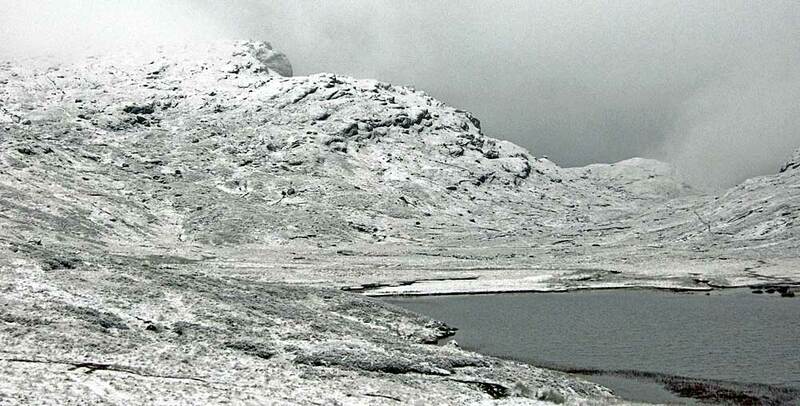 Above right: On the plateau, looking back towards the top of the Beinn Ghlas Falls. The only views taken of the hill on the way up are shown below. 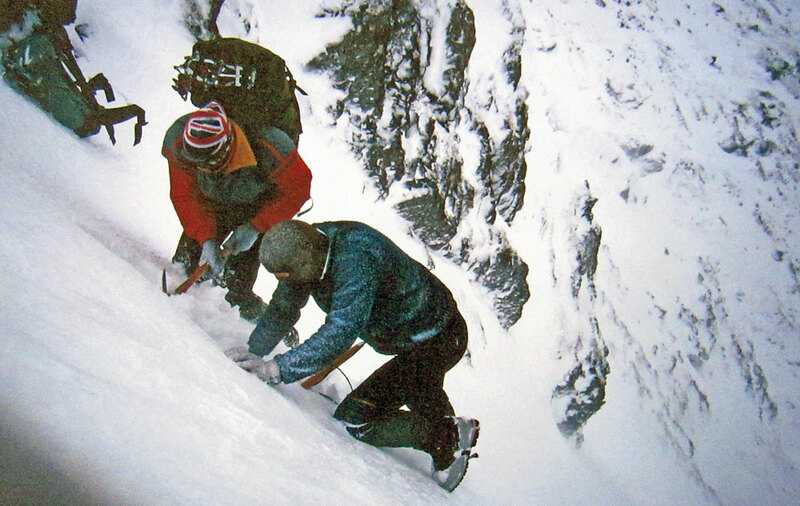 Visibility decreased rapidly during the climb and there was no view whatsoever from the top. This is the Great Marquess No.61994 powering up the final incline in Glen Falloch before stopping at Crianlarich to take on water. 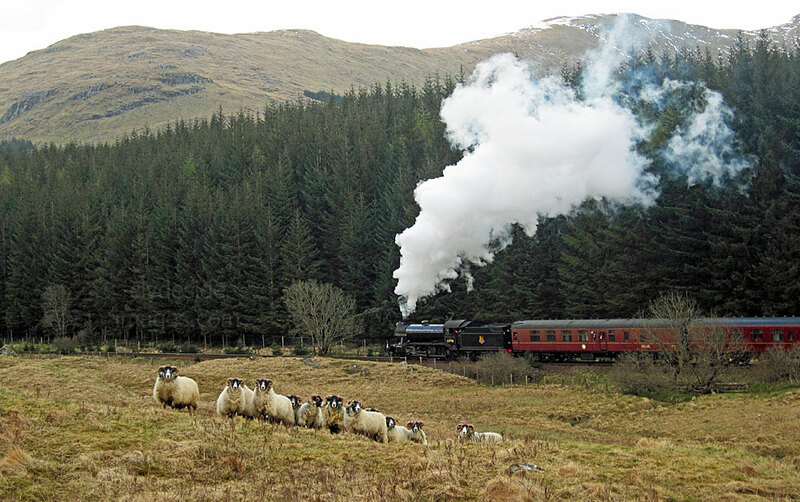 The steam loco was operating on a Great Britain V rail tour and any excursions with steam engines draw a large number enthusiasts and general spectators, many trying to photograph the train against the spectacular West Highland scenery. 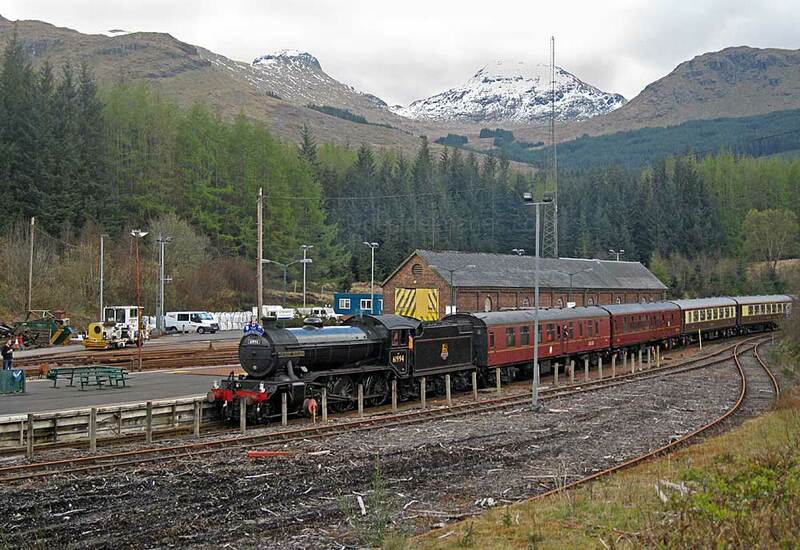 Cruach Ardrain towers above Crianlarich Railway Station. Walkers head towards the main summit from Beinn Challum`s South Top. 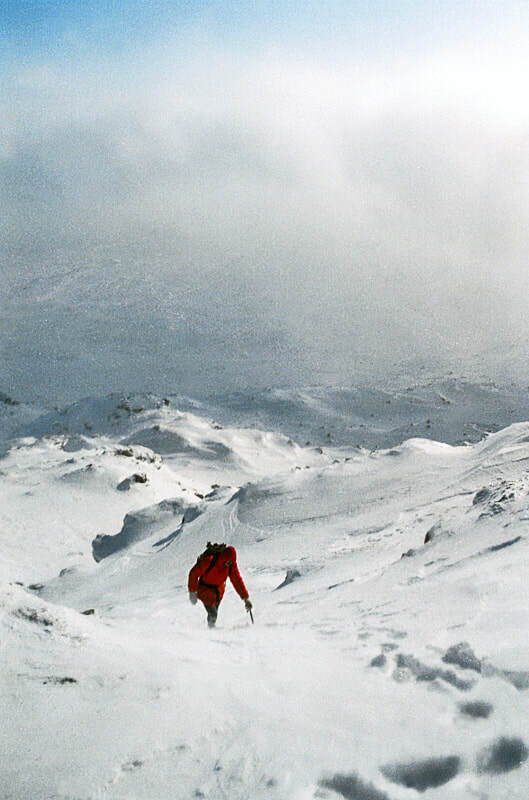 Above left: After climbing Ben Lui, two walkers head back towards Tyndrum on the Cononish track. 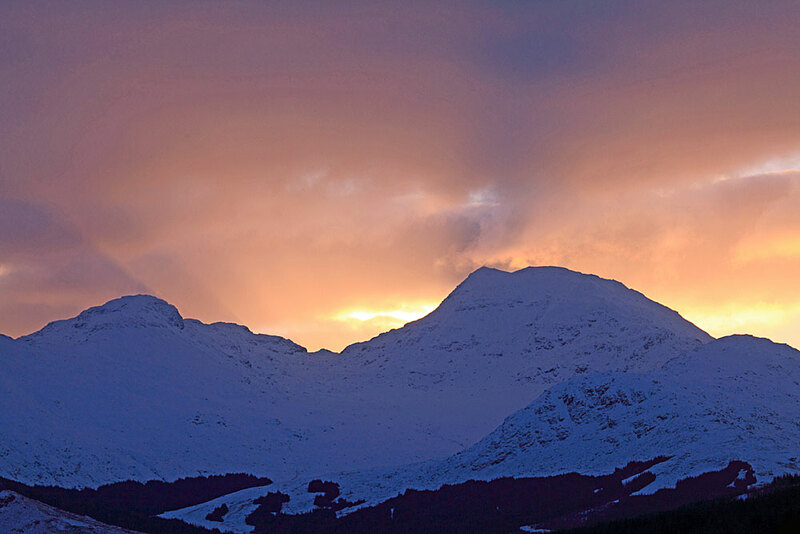 Beinn Challum forms the backdrop. 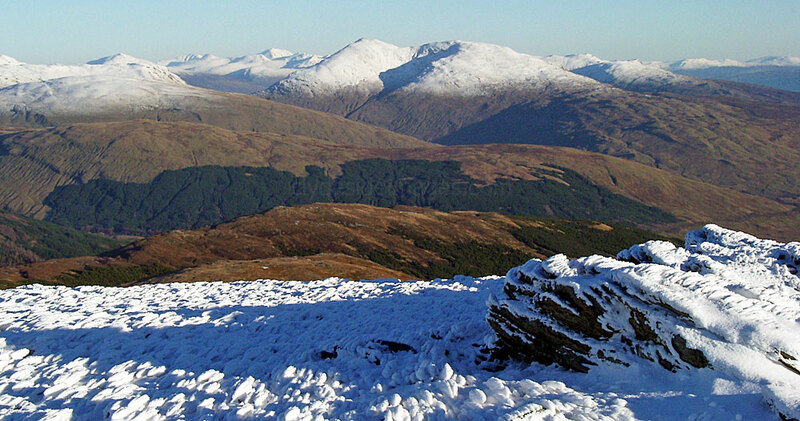 ​The view on the right shows Beinn Challum, with its well-defined twin tops, seen from Beinn Chuirn, to the southwest, on a fine winter`s afternoon. The above slideshow features shots taken on 2 January 2003 when I climbed Beinn Challum for the second time. 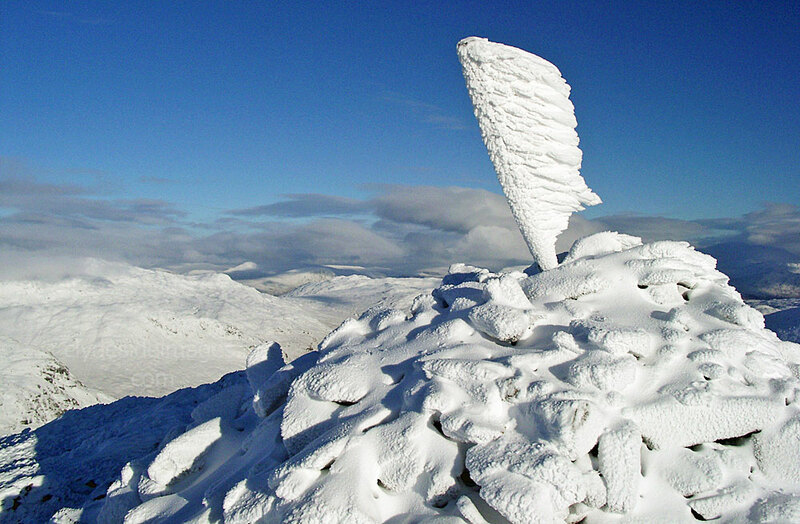 The cairn on Beinn Challum`s main top, Thursday 2 January 2003.